This passage is the closing paragraph from last year’s Epiphany homily by our Holy Father, Pope Francis. It highlights a couple of themes that help us in our journey as seekers of the light that is Christ. 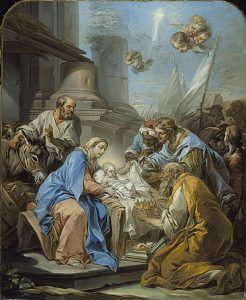 As we have just recently celebrated the Solemnities of the Nativity and Mary, the Mother of God, which points out for us the humanity and the divinity of Christ, respectively. In this feast we see the humility of His humanity and the glory of His divinity collide. The Magi show us that as we journey towards the Light we will encounter uncertainty and darkness. But He does not leave us to ourselves to “figure out” how to find Him. He gives us certain lights and revelations to lead us closer to him. My life doesn’t really mean anything since I don’t have a mission or purpose…etc. It’s easy to doubt that God can work in the ordinary brokenness of life… except this is EXACTLY where He desires to dwell. He loves us the same, whether we are a religious or a lay person. Although our relationship may feel different, we are still the same Beloved Daughter in His Eyes. Let us be like the Magi on the Feast of the Epiphany. Let us follow Him into lands unknown to us, to places too seemingly ordinary for the Presence of God. Most importantly, let us realize the Presence of God in our own hearts that dwells in us during our earthly pilgrimage. We also celebrate today the Feast of Saint Andre Bessette, 9 August 1845, 6 January 1937: a Canadian religious brother and one of our Leonie’s Longing patrons. Saint Andre, pray for us! Many of you, I am sure, can remember the day of your entrance into Religious Life. It was a momentous occasion with tears of joy mingled with those of sadness. On that day you had a rough vision of what the rest of your life would look like, and knew that your life choice was an offering up of married life and the prospect of children. On this day we celebrate the “entrance” of Our Lady when, according to the tradition of the Church, she was presented in the Temple by her parents Anne and Joachim and dedicated to a life of consecrated virginity. Her life had an expected trajectory and there was no reason to doubt that these plans would not come to fruition since it seemed to be the Will of God. Why would God not fulfill this plan? We all know what happens at the Annunciation when it seems as if God changes His mind. Why did He wait almost ten years? You would think He would have hinted to her or her parents at some point! Does Mary protest? Does she quit? Does she think she “failed” God? Of course not! In a very particular way, we are conformed to Mary’s Immaculate Heart since we too have offered ourselves to the Lord, and we too have experienced the crumbling of our expectations. But this sudden change is not a failure or a rejection! The reason we can look to Mary as a model is not just that Mary did not complain or sit there feeling sorry for herself. More importantly, she also knew that this “mistake” was still part of God’s plan. She did not doubt that He would fulfill all of His Promises, and she even rejoiced at the news! Imagine, being an unwed mother in a society that didn’t accept her kind of situation very easily. Imagine having to tell Joseph and her family, and being gossiped about in town. We can see her as an example of encouragement and proof that God still has great plans for us, that we didn’t “fail” Him or our vocations- since He is infinitely greater than those things (yes, even our vocation)! We can say with the utmost faith that He still receives us as a gift, even though we might feel like the gift of ourselves that we made on our entrance day was not accepted. He receives you with open arms. You are His Beloved Daughter still and always! 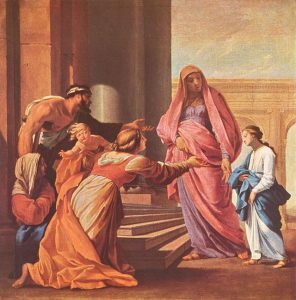 Rejoice today as we celebrate the Presentation of Our Lady and let it be a reminder that because of Mary;s “yes” we are able to call ourselves Daughters of God and even “co-heirs” with Christ in the Heavenly Kingdom, regardless of our earthly vocation.